We love riding our bicycles. Wanna feel like a kid again? Ride a Bicycle. Wanna CLEAR YOUR HEAD!? Ride a Bicycle. Need a little time away from reality? Ride a Bicycle. Wanna lose a few pounds or 100 or more? Ride a Bicycle. Wanna get or stay healthy? Ride a Bicycle. When we decided to move away from SD one of the Big Things on our list of, 'here's what we would like for our new place to have', near enough to ride our bicycle to the Katy Trail without loading them up to get there. We now live RIGHT on the Katy Trail. Our Road and Driveway both cross right over the Katy Trail. I love to also sit out on our Big Front Porch (another of those things on the list) and watch other riders go by, riding down the Katy Trail. We arae so Blessed! 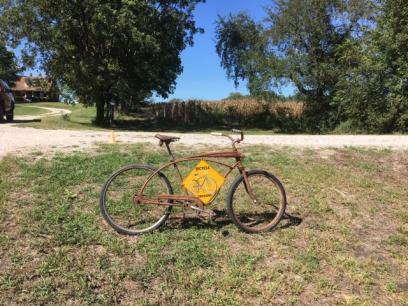 We bought and set up the 'Bicycle Crossing' Sign, and the Antique Bike, for our Driveway coming in to our place. Our Property Line STARTS right at the KATY Trail. From the KATY Trail toward the house is ours. Riding our Bicycles down the driveway to the KATY is a Big Deal for us. We love it! We often ride to the next towns and further just for our Morning Rides. We have met such nice folks out there! Bicycle/Trail Use People are SUCH NICE FOLKS! You very rarely run into a crabby person using the KATY Trail! We 'run errands' on our bicycles too. We have panniers for Groceries as well as anything else we need to carry to or from town. This is especially fun on our Tandems. We often ride our Bicycles to Church and home on Sunday Mornings. Deron and I are planning to not only ride the KATY end to end again, but also do each section both ways. That is, day trips. The contents of this page for Katy Trail is still under construction. Please check back later.